The Division92 Little Free Library was cleared out again. As before, no damage that I could see. But all the books are gone. English, Mandarin, Vietnamese, Spanish, adult, children’s, fiction, non-fiction, newer, used all gone. Most of them had library or used-bookstore stickers on them, so I’m not sure they’re worth anything to someone trying to sell them. WTF? So I’ve put out a handful more books today. I saw this in my Facebook feed today. After checking its veracity (yep! posted on Nick Bruel’s FB page, and just today, too! ), I knew I had to share it. If you are that easily offended, maybe you shouldn’t be working in a library. Or with children. Or, really, anywhere near People. My name is W. and I am a library aide at L. Elementary in L, OH. Your books are very popular in my library. It was brought to my attention today by a parent that your books contain symbols ( #%&*@ ) in the dialog that most people would interpret as cuss words. This parent was asked by their child what the symbols meant and the parent had no other explanation. Please tell me that this was not your intention!!! If so, I am going to have to pull your books from my shelf and that is going to make a lot of kids disappointed. Thank you for inquiring. I embrace this opportunity to clarify this longstanding misconception. I was hoping that it would be obvious from the context of the story, but the symbols ” #%&*@” clearly stand for pineapples. I’m sorry. I’m deflecting. I’m trying to distract you into a different topic rather than address the one at hand, and you deserve better than that. I confess— ” #%&*@” are representative of cuss words. Which cuss words? Well, I leave that to the imagination of the reader as has been tradition for many, many decades. The use of ” #%&*@” has been a comic trope used by cartoonists for almost as long as there have been cartoons. Think Beetle Bailey and Sarge. Andy Capp and Flo. Garfield and Odie. I always imagine that if you were to put into words what Donald Duck was actually saying when he dropped a hammer on his webbed foot, it would look a lot like ” #%&*@”. This brings us to my offense. I sense you are outraged by my use of ” #%&*@”. That is your right, of course, but I confess that I’m a bit bewildered by it. I’m not actually using cuss words. As you point out yourself, I’m using symbols that represent non-specific cuss words. So is it that you’re offended by my implying that cuss words actually exist? They do, but I didn’t really have anything to do with that. And I suspect that your students already know them. My daughter hears them virtually every time I drive on the Garden State Parkway in New Jersey. Have you ever driven it? It’s just… just horrible. No one uses turn signals. Cars enter from the left and the right. There are tolls all over it. The speed limit for much of it is 55, but if you’re not going 70 you’re taking your life in your hands and… I digress. Sorry. The point is, my daughter knows these words because of my anxiety ridden death slaloms through New Jersey. As for your students, they didn’t learn them from me. As to my punishment— I’m sorry you feel the need to remove my books from your shelves. I won’t talk you out of it, because those are your shelves and you should do with them what you feel is best. I’m not too concerned, since I’m fortunate and feel reasonably certain that your students can find my books elsewhere if they were to try hard enough. I regret that your kids will feel disappointed, but not so much that I feel compelled to change they way I write my books. I imagine that your students will feel disappointed because they LIKE the way I write my books, ” #%&*@” and all. I will say that of all the things that will challenge them in their future readings, my symbols will likely be the least of them. But that’s a good thing. How dull our literature would be if we weren’t exposed to those things that bewilder us, perplex us, and possibly even offend us. I will say one more thing. When you remove my books from your shelves, rather than dispose of them, I do hope you will consider donating them to another school, another library that might have use of them. But if the thought of exposing students other than yours to the crimes of ” #%&*@” concerns you, then you may send them to me, and I will gladly find them a happy home. I’ll even pay for shipping. I skipped the Kavanaugh hearings. I didn’t watch or listen to the news, I scrolled past articles and posts about it on Facebook, I declined to participate in conversations about it. I couldn’t possibly participate in any of it and not rage/cry/shut down to the point of needing medical intervention. Instead, I provided service for my kids, their teachers, and their families as best I could at work. I made plans for consulting with coworkers at the main office the day after. I had pleasant interactions with the bus drivers and fellow riders on the way to and from work. I got home, scritched the one kitty who likes skritches, put some new toys out for the other two kitties, cleaned out my lunchbox, took out the trash, and washed my hands and face. Monday I will start collecting money for a donation to my local Planned Parenthood, a gift card towards a giant pizza party, and I’ll probably buy cookies to deliver with the gift card, to say thank you to everyone who works there. You gotta get through the best way you can. Towards that end – I dug through all my donations and put together a collection of books about women and girls. Strong women: may be know them, may we be them, may we raise them. I have a lot of feelings about banning books and “sanitizing” them for children or telling children they can’t read certain books (or at least can’t read them yet). I don’t think I could have put better words to my feelings, though, than Melissa Scholes Young did for her piece in the Washington Post. I grew up in a country with heavy censorship rules. Lots of books, magazines, TV shows, and movies never made it into the country at all. Those that did were subject to “editing” – a movie with a romantic scene of, say, two people kissing would look like this: two people leaning closer together, then suddenly leaning apart. The censors didn’t even do a pretty job of it – they simply removed the kiss. Talk shows with an unfavorable guest – that person’s segment would be edited out, regardless of references elsewhere in the show to that guest. Sesame Street would be edited – no scenes with pigs in them, as they are vile, unclean animals. Mumford the Magician, instead of saying “A la peanut butter sandwiches!” would mouth words silently for a second, then you’d hear “…peanut butter sandwiches!” It didn’t matter than the “a la” part was actually French. It sounded just like “Allah”, and you just don’t take God’s name in vain. Or in jest. Or anything else, really. Archie comic books would show up with black marker all over the girls’ swimsuits, so you didn’t see too much skin. They never blacked out the boys’ shorts or chests, just the girls’. A popular children’s magazine at the time put out an issue with a feature on a kid from Israel. I think it was about the growing popularity of soccer around the world, or something as intense as that. But because the kid was Israeli, and Israel was, shall we say, not in political favor, the censors ripped out that section of Every. Single. Copy. of that magazine before putting it on the magazine racks in the grocery store. I grew up in an area of mostly Americans, some Brits, and a small percentage of folks from other countries. Most everyone ranted at some time or other about how oppressive the censorship was, how much better it was in other countries, especially in the US with their Freedom of Speech and all that. Then I move back to the US and I hear how determined one group or another is to ban one book or another, to forbid the very mention of certain topics, But Who Will Think Of The Childern! Someone Must Protect The Childern! (misspelling intended for dramatic wailing and rending of garments). Are you freaking kidding me? We’re supposed to be the Land of the Free and the Brave! Freedom of Speech! IT’S THE FIRST FREAKING AMENDMENT TO THE CONSTITUTION, BECAUSE IT’S THAT DAMNED IMPORTANT. Children are way smarter than most grownups give them credit for. More flexible in their thinking, more resilient than most grownups think too. I’ve been working with children my entire adult life, and a fair share of my life before I turned 21, for that matter. Children have an amazing capacity for understanding and adapting, when given honest opportunities. Children also have a pretty decent ability to figure some things out for themselves, given sufficient input. Lying to them, removing possibilities from them, deliberately misleading them, this does no one any good. What happens when those children find out you’ve been bullshitting them this entire time? They cease to believe anything further you have to say. Give them age-/developmentally-appropriate information and vocabulary, sure. Protect them from everything in the world that is or might be scary? If you remove all conflict, all risk, all potential danger, how in the world do you expect them to develop any skills to manage such moments on their own, down the road? Instead, help them navigate those moments. Help your children see those conflicts and risks and dangers for what they are – opportunities to observe, evaluate, reason, plan, and move forward. As you are doing so, use age-/developmentally-appropriate language and concepts and examples. Add to that information and vocabulary as they grow up and their cognitive skills develop. Give them credit for being the thinking, reasoning, functional human beings they are becoming. While you’re thinking about that, here are some children’s books that have been challenged and banned over the years. Which of these have you read? How thoroughly were you damaged by them? Do you read any of these with your own children? How comfortable are you given these as presents to someone else’s children? Me? I’d read everything here except the Harry Potter books by the age of 12. And yet, somehow, by all accounts, I’ve turned out to be a reasonably well-adjusted, somewhat appropriately-social, contributing member of society. Book banning is a serious form of censorship. A challenge is an attempt to remove or restrict materials, based upon the objections of a person or group. A banning is the removal of those materials. Challenges do not simply involve a person expressing a point of view; rather, they are an attempt to remove material from the curriculum or library, thereby restricting the access of others. As such, they are a threat to freedom of speech and choice. Books are banned or challenged for moral, political, religious, or commercial reasons. Once the book is banned, readers have either limited or no access to it. Every year, during the last week of September, a major event is held that promotes the freedom to read. Banned Books Week brings together librarians, educators, publishers, and readers who unite to draw attention to the harms of censorship. Some folks have very definite ideas of what is and isn’t okay for other people to read and think. And when it comes to children and children’s literature? Forget about it. Attempts have been made to ban “Huckleberry Finn” in schools, libraries, and bookstores since the first month after it was published in 1885, and has been challenged more or less continuously ever since. Want to know why? Racial Issues: About and/or encouraging racism towards one or more group of people. Encouragement of “Damaging” Lifestyles: Content of book encourages lifestyle choices that are not of the norm or could be considered dangerous or damaging. This could include drug use, co-habitation without marriage, or homosexuality. Blasphemous Dialog: The author of the book uses words such as “God” or “Jesus” as profanity. This could also include any use of profanity or swear words within the text that any reader might find offensive. Sexual Situations or Dialog: Many books with content that include sexual situations or dialog are banned or censored. Violence or Negativity: Books with content that include violence are often banned or censored. Some books have also been deemed too negative or depressing and have been banned or censored as well. Presence of Witchcraft: Books that include magic or witchcraft themes. A common example of these types of books are J.K. Rowling’s Harry Potter Series. Religious Affiliations (unpopular religions): Books have been banned or censored due to an unpopular religious views or opinions in the content of the book. This is most commonly related to satanic or witchcraft themes found in the book. Although, many books have also been banned or censored for any religious views in general that might not coincide with the public view. Political Bias: Most Commonly occurs when books support or examine extreme political parties/philosophies such as: fascism, communism, anarchism, etc. Age Inappropriate: These books have been banned or censored due to their content and the age level at which they are aimed. In some cases children’s books are viewed to have “inappropriate” themes for the age level at which they are written for. Many books have been banned or censored in one or more of these categories due to a misjudgment or misunderstanding about the books contents and message. Although a book may have been banned or labeled a certain way, it is important that the reader makes his/her own judgements on the book. Many books that have been banned or censored later were dropped from banned books lists and were no longer considered controversial. For this reason, banned books week occurs yearly to give readers a chance to revisit past or recently banned books to encourage a fresh look into the controversies the books faced. Source: “Common Reasons for Banning Books,” Fort Lewis College, John F. Reed Library. Banned Books, Censorship & Free Speech. November 15, 2013. Web. March 19, 2014. Find out how a book challenge/ban works here. 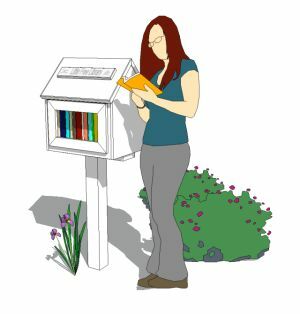 As soon as I’d heard of Little Free Libraries, I knew I wanted to host one of my own as well. I don’t know how long it took me to get around to ordering one, but it took almost three years to get from my LFL showing up in the mail to putting it in the ground and opening it up to the public. I started to paint it myself. I had a plan (pumpkin orange, eggplant purple, olive green, was going to make stencils to have “Division92 LFL” on one side). I did get the weatherproofing stain done, inside and out. I also mod-podged several pages of an old book to the interior of the lower level – the pages are from the beginning of a chapter, and I managed to keep them in order, so you can read every other page from the first 12 or 14 pages from the 6th chapter of this book no one’s heard of. Then my LFL sat in my garage. And sat and sat and sat. An artist friend of mine offered to paint it for me. I couldn’t say “yes” quickly enough. She got it all done for me, and with the color scheme I’d originally wanted. She included the dogwood tree over the LFL and the flicker that visits the feeders in our yard! She even donated a bag of books to get things started! I wish we’d managed to get the post sunk just a little deeper into the ground. As it was, it took at least three of us to get it in as far as we did – We live on an old river bed, so our yard is nothing but packed clay and river rock with raised fruit/flower/veg beds sitting on top. Because the post is set so high, and because of our 3-foot fence, short & little kids can’t get into the LFL on their own. Which means the children’s books aren’t moving quite as well as I’d hoped. On the other hand, little kids don’t pass our house very often on their own in the first place. I’d also hoped to be able to set up a bench or chair for folks to sit and look through books for a bit. Unfortunately, there are some factors that prevent this. 1) We don’t have a sidewalk strip, and we do have a fence right at the edge of our yard. So nowhere to put seating that doesn’t block the sidewalk 2) Our neighborhood is a little sketchy, so the seating would likely disappear fairly quickly. I’ve been pleasantly surprised so far (knock on wood!) that we haven’t had any vandalism yet, nor any weirdness left inside the LFL, but I also have to assume that’s just a matter of time. As it is, our LFL is set up in full view of the large windows of our house. Not only can we watch people at our LFL, it’s obvious from the sidewalk that we can. I suspect this has helped prevent some issues. We’re just getting into our rainy season. I’m going to have to look into some weatherproofing strategies. I know I need some DampRid inside. I might also look at blocking up the joins to make sure rain and bugs can’t get in that way. I’ve also been meaning to find a new latch. The latch that came with my LFL is nice and all, but if you don’t set it just right, the door sometimes opens on its own. I’ll eventually get some light inside as well. Probably just some cheap battery-powered lights, as I have to assume they’ll disappear quickly. Though I do know one or two people who might be able to rig up a solar-powered thing. Hm. Right from the beginning, people knew what to do. We not only noticed books leaving, we noticed new books showing up. And the one day the LFL was wiped out (seriously – adult, children’s, English, other languages, fiction, non-fiction – *all gone*), I was on my way to an all-day event so I couldn’t do anything about it. On my way to my event, I posted to my neighborhood facebook groups that I was a little surprised and sad about it, but that we’d keep going. By the time I got home, less than 6 hours later, the LFL was completely full, someone had dropped off two boxes of books, and someone else had texted me to say they intended to drop off books but found it full so they gave the books to another, nearby LFL. And almost all of those messages and books were from people I still haven’t met yet. How awesome is that? We’ve also gotten boxes and bags of books from folks in the neighborhood or at least passing through. There’s one guy who’s given a TON of books and I haven’t been home for any of his donations yet. My MIL met him once, and everything else was just set on our front porch. I like to think I’m getting to know him at least a little by the books he’s given us! Most folks are using the LFL when I’m not home, or at least not outside. I’ve spoken with a few people. I’m hoping to find some regular visitors and get to know them a little. That’s an ideal outcome, though. Right now I’m happy people are using it, nothing truly awful has happened yet, and I’ve been gratified by the few folks who do spot me while I’m gardening, and shout “thanks for the books!”. Looks like, overall, we’re doing okay. I find tattoos fascinating. I’m always interested in what designs people choose to put on their bodies – I want to know the stories behind them. You can only imagine what I think of literary tattoos. Lucky for me, I live in Portland, OR, one of the most tattooed cities in the US. 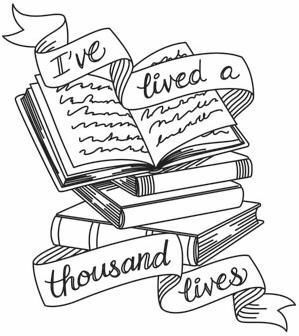 What books, what authors, what quotes and images stick with you? What sticks with you and becomes important enough to put on your body permanently? What are favorite tattoos you’ve seen? quotes and images from books on Popsugar – who would have thought to combine Nancy Drew with Hamlet? How Come I’m Not Colored? Why Does Mommy Have a Tattoo? ***I have no connection to any businesses or websites linked in this post. I just think the tattoos and books are awesome. I make no money nor do I receive anything of any sort from these businesses when you click through the links.